After you chose your yarn and your needle, cast on 20 stitches. Knit at least 3 or 4 rows of any stitch you plan to knit, and then pull out the needle and measure the length of your knitting by a measuring tape. Now divide that number by 20 and here you get the measure per one stitch. For example, you plan to knit a rectangle 40 cm by 100 cm. You cast on 20 stitches and knit some rows, you take out the needle and measure it and you get 30 cm. Then 20/30=0.66 means you need 0.66 cm per one stitch. 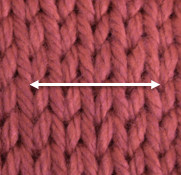 You need to knit 40 cm, then 0.66*40=26.6≅27 means you need to cast on 27 stitches.